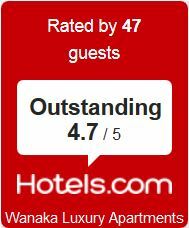 "A great place in a great location"
Room Service and quality additional comforts like spa bath indoors and outdoors. Close to township.gorgeous views of mountains, lovely spa.Great accommodation. Stayed in a one bedroom apartment for 4 nights and couldn’t fault it. Cable TV, free WiFi , a nice little kitchen, comfy bed, semi-private outdoor area and bathroom with a spa and heat lamp – it was all we needed. For outdoors activities they’ve got a pool and spa – which we didn’t avail ourselves of – and about 4 bikes which we took out for a ride around the lake (no cost). The service was exceptional – they were always only too happy to help if we needed anything. And we even got a box of chocolates on Xmas Day! This was a real find. We only had one night. But it was such a lovely, clean place to stay. Wish we had longer. Super bath and lovely gas fire. Absolutely recommend it and not a terribly long walk from centre. "The nicest apartment we rented in New Zealand"
The apartment was fantastic. Great location as it’s very close to the lake and the Wanaka tree. All the amenities were present in the house. My boys loved the heated bathroom floors.The owners are very friendly and helpful with suggestion with places to visit and tours. This is our third time staying at Wanaka Luxury Appartments. They are still as good as the first time we stayed. I highly recommend it here. You will definitely NOT be disappointed. You are close enough to Wanaka central (5-10min easy stroll) but far enough away for peace and quiet. There is a pool and spa for everyone’s use and the gardens are lovely. We have stayed twice on Lansdowne Street which is a cul-de-sac and very quiet. I would recommend asking for Lansdowne st as it’s the quietest street and has a beautiful tree lined walk to the lake. "The quality of finishes, excellent facilities"
Spent a week here in a two bedroom unit. Travelling with two young children can be a challenge but these apartments offered all that was needed for a comfortable family holiday. Locatin was good. Very quiet but central to all the local attractions. Short drive to restaurants and shops. Snow capped mountains visible from upstairs was a beacon for the fun to come. Recommend the apartments especially to families. Stayed for a week in a one bedroom apartment whilst skiing and generally exploring the area. Apartments were very nicely finished inside and out, and felt really homely. The apartment was quite large for a one bedder, with impressive bathroom and gas fireplace in the lounge. loved the stone work around fire place, great gas fire, coffee machine a nice touch. Daily servicing of apartment was appreciated. WiFi is good. Travelled to Wanaka as part of a South Island trip. The one bed apartment was great. Clean and modern. Pool a bit cold for my liking but the spa was great. Staff helpful. The bed was fantastic if you like firm mattress. Great as an all year round destination. 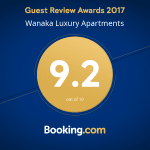 Wanaka Luxury Apartments was just what we needed and the price was very good. Unfortunately we didn't get to use the swimming pool, there seemed to be a private party going on when we tried to use it. One thing I would say is that I noticed a few spider webs in the room which isn't great but didn't spoil it. The beds are very firm which I don't particularly like but that's a personal preference! Overall it's a very nice place. We stayed for three or four nights in a one bedroom apartment. Apartment was spacious which allowed us to settle in and relax. We were located in quite a residential area which I thought was a bit odd, however it was great to take time out from the tourist areas we'd stayed in elsewhere in the South Island. The main centre of Wanaka is about a 10-15 walk away (we're slow walkers!) but it was a nice walk. We booked this for one night only and we were extremely satisfied with our accommodation. The rooms are beautiful - real value for money! The service is probably what impressed me as we were really made to feel special on our arrival. We will definitely stay here next time we're in Wanaka!